It’s finally summertime! Here at Happily Hooked we’re buzzing about picnics. From Saturday afternoons at the beach to week long vacations to family reunions, picnics seem to be a recurring theme across all our team members’ summer plans. What could be better for a summer picnic than the perfect picnic blanket? The beautiful Serenity Blanket by Michelle Ferguson fits the bill brilliantly. 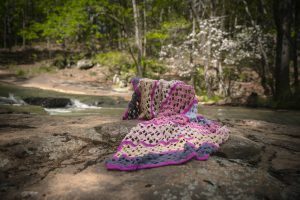 With a light, airy pattern and a size perfect for putting out a spread or just stretching out with a book, it’s bound to be the blanket for all your picnic needs this year. The best part is that it can be customized in your favorite summer colors! Would you prefer pops of bright yellows and reds, or the soft blush and peach of a late August sunset? The July Pattern Pack will be live for Gold Members July 1st. You’ll also be able to purchase it on Ravelry – and pick up past issues of TPP and HHM there, as well! Big Boy Blanket - #4 Car!